WESLEY CHAPEL – Rain wasn’t the only thing pouring on Wiregrass Ranch’s Homecoming parade, Steinbrenner junior halfback Kendall Pearcey’s touchdown total was too. 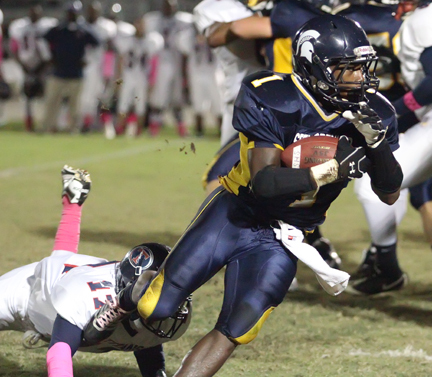 Pearcey’s six total touchdowns led the Warriors easily over the Bulls 56-0 on Oct. 28. The night started out well for Wiregrass Ranch (0-8), as the running combination of quarterback Jake Day and freshman fullback Eli Galvin gave the Bulls good field position early. But Day’s key mistake came on an attempted shuffle pass to Galvin, when Steinbrenner (5-3) senior defensive back Andrew Feldhaus broke through the line and intercepted the ball, taking it 57 yards for a touchdown. Even with a steady rain falling, Steinbrenner avoided mistakes and would control the pace of the game from there. Pearcey received the brunt of the carries because of season-ending injuries to running backs Shaheem Barthel (dislocated elbow) and Jake Carroll (torn ACL), but it didn’t slow things down for the Warriors. After Kyle Bade intercepted a pass late in the first quarter, Pearcey would lead the charge downfield. After two 11-yard gains, Pearcey found a gap and went untouched for his first touchdown of the night. In the second quarter, Feldhaus made his second interception return of the game of a touchdown off of a bad pass from senior Jamal Nunez. “Those were my first two interception returns of my career, it felt good,” said Feldhaus. After another interception late in the first half by Bade, Pearcey added his second touchdown to the board making it 27-0 Warriors at halftime. In the second half, Wiregrass Ranch finally completed its first pass of the game, but would falter into another three-and-out situation. Steinbrenner would show no mercy, as senior Zack Jones’ pair of 15-yard gains set up Pearcey’s third end zone appearance. Pearcey would go onto return two punts of 61 and 63 yards to the house and added two more rushing touchdowns to give him six on the night, a new Steinbrenner school record. “Coach said I was going to get the ball tonight and I just did what I had to do,” said Pearcey, who finished with 115 of Steinbrenner’s 162 total yards on the ground. Wiregrass Ranch Head Coach Jeremy Shobe gave credit to the Warriors’ size and ability on defense, which eventually wore his Bulls down. Steinbrenner will travel to Chamberlain (1-7) on Friday Nov. 4 in its final district game of the season and the Bulls will look to get into the win column for the first time this season when they travel to Freedom (1-8).